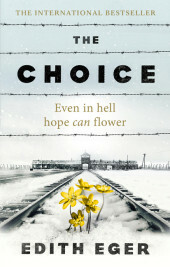 The incredible, bestselling memoir of survival, hope and empowermentTHE AWARDWINNING INTERNATIONAL BESTSELLER'Little dancer', Mengele says, 'dance for me''One of those rare and eternal stories you don't want to end and that leave you forever changed' Desmond TutuIn 1944, sixteen-year-old ballerina Edith Eger was sent to Auschwitz. Separated from her parents on arrival, she endures unimaginable experiences, including being made to dance for the infamous Josef Mengele. When the camp is finally liberated, she is pulled from a pile of bodies, barely alive.The horrors of the Holocaust didn't break Edith. In fact, they helped her learn to live again with a life-affirming strength and a truly remarkable resilience.The Choice is her unforgettable story. It shows that hope can flower in the most unlikely places. "Edith's strength and courage are remarkable in this memoir as she draws on her own unthinkable experience in Nazi concentration camps to become a therapist and help others recover from all kinds of hardship. Her life and work are an incredible example of forgiveness, resilience and generosity." Sheryl SandbergA native of Hungary, Edith Eger was a teenager in 1944 when she and her family were sent to Auschwitz during the Second World War. Despite overwhelming odds, Edith survived the Holocaust and moved with her husband to the United States. Having worked in a factory whilst raising her young family, she went on to graduate with a PhD from the University of Texas and became an eminent psychologist. Today, she maintains a busy clinical practice and lectures around the world. Sophie Scholl and the White Rose Dumbach, Annette E.